What do Jeremy Tinder, Joe Tallarico, Nate Beaty, Onsmith, and Grant Reynolds, all have in common? They're all in Trubble Club and have contributed to Ten x Ten! Colin: First I think we should explain who you are and what Trubble Club is... What is your relationship with the group and are you able to tell us a little more about how Trubble Club started? Jeremy: Trubble Club began as a group of local cartoonists just getting together to hang out and draw. Many of us had been getting together and making exquisite corpse drawings or just hanging out in apartments or on stoops making drawings. 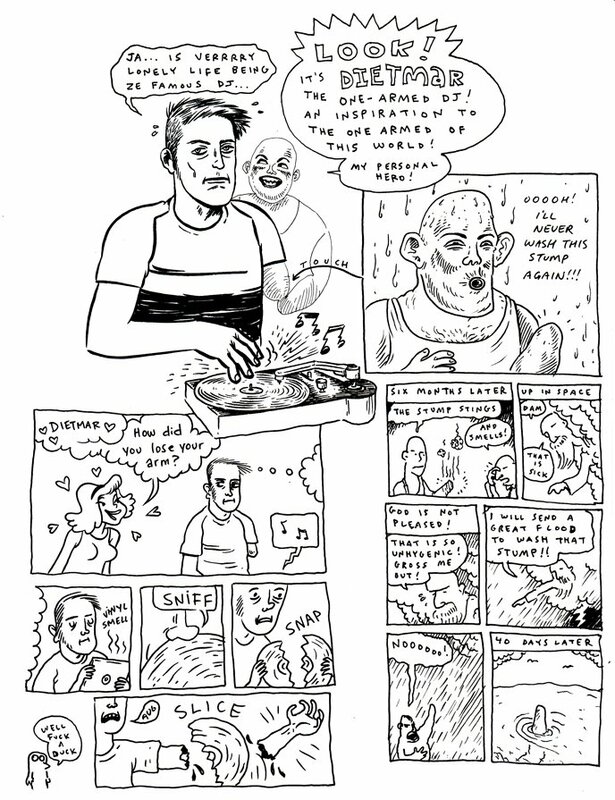 One night, Lucy Knisley had a large group of us over, and the first Trubble Club comics were drawn. We didn't set out to start a collective or collaborative group, it just happened. We had so much fun, we started meeting weekly, and developed kind of a formula for making jam comics. Our comics generally begin as a single panel drawn by a single artist, but gets thrown into the "pile" or "stack". That stack is passed around to artists ready to draw. Once they find a strip they have an idea to add onto, they do so, and pass the stack around to someone else. Some comics are finished in a session or two. Some take years. Some never get finished. As far as my relationship to the group, I would say I'm the group's biggest fan. I love these comics. I've been referred to as Trubble Club's "dad" by other members. I archive the original comics and often coordinate the printing of issues. I think I just look older than most of the group (but I'm not). 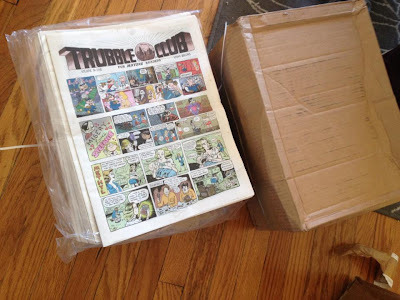 Colin: Trubble Club appears to be a huge morphing group of talented comics artists. You say you all meet in a secret location every Sunday. How intriguing! Is the group really as big as I imagine it to be, and are you ever afraid that your location will be revealed? Jeremy: We try to meet every week. Usually things slow down a bit in the summer. We've been switching days too. It was Sunday for a long time, then Tuesday for about 9 months. Lately, it's been Mondays. The location shifts as well. If anyone knew what they were looking for, we'd be very easy to spot. Colin: Trubble Club is about to release it's 5th issue. Can you describe the process of putting it together? Have past issues taken the same form, or does each issue evolve? Jeremy: The creation of this issue has been a very slow process. I brought up the idea of us doing a newsprint, Sunday funnies-style issue back in the spring of 2009, and we all started working on it. Our process is often slow, as people only work on a strip when they are inspired to do so, and these strips were much longer than our normal strips, averaging 9 panels instead of 6. We also drew much larger than normal, and colored all the strips. Then it was a matter of getting the money to publish this thing. We applied for some grants and things, but nothing came through. Then, sort of out of the blue, Chad Kouri and the Post Family stepped in to help us, which was amazing. Edmar also pitched in some cash, and the rest was funded by one of our members. So, it took two and a half years to finish! It was originally going to be our 4th issue, but took so long we make it our 5th. We actually have issue 6 in the bank waiting to come out after this one, and 7 is almost ready as well. Colin: Are there any events planned for the release of issue 5, a celebration maybe? Jeremy: Yes, we will have a release party at the Post Family space on March 7th at 7pm!